At a recent gathering in London’s Notting Hill, I put my hand into a bag of cool, red rice and let it slip through my fingers. A strange thing to do at a party perhaps, but this was Heritage Rice, and cause for much celebration as it was part of the first organic rice harvest from Ulpotha, a village in the heart of rural Sri Lanka. These bags of rice were the realisation of a vision, which over the last few years has become a wonderful reality that is Ulpotha today. 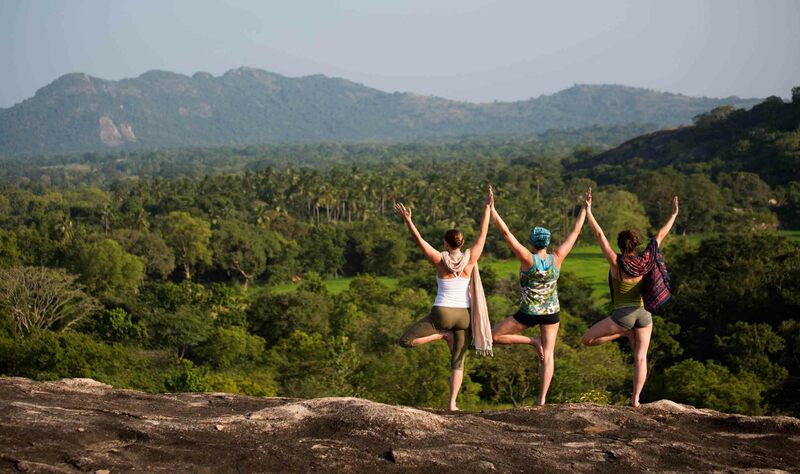 Ulpotha, located in the dry zone of central Sri Lanka, is the site of a holistic environmental and cultural undertaking by a non-profit organization, The East Pole Foundation. It has at its heart an exciting project, aiming to help a small village to transform itself from an abandoned coconut plantation into a vital bio-diverse organic agricultural village. Their approach has been to draw significantly from tradition, while not abandoning the modern, to recreate an environment where nature and man live in productive harmony. It is also a unique Sanctuary, which is open to visitors. Guests can enjoy a relaxing holiday or retreat. They can be part of village life and learn about the traditional practices, or can take part in a workshop such as Yoga or Tai Ji. The revenue from visitors is crucial to the project. It will enable the environmental work to continue and for Ulpotha’s future to be safeguarded. The recent organic rice harvest has been very successful. The yield has been 70% of the usual harvest that the farmers would receive. It has proved to the local community and the farmers in particular, that going organic can be done and that there will financial benefits too. The hope is that farmers throughout the area will be convinced and, in time, also revert to organic farming. In three years time the Heritage Rice will receive its official organic certification. The name Heritage Rice is given because it is not just organic principles that are employed, but traditional methods too. Buffalo are used to plough the fields and thresh the harvested paddy. Buffalo are perfectly suited to paddy cultivation and produce their own fertiliser and milk as well. The crops are protected from pests using traditional methods that include various applications of cactus milk, crushed neem seeds, dried makra leaves, branches of the kadura tree, jakfruit sap and crushed coconut refuse. Spiritual links are maintained by holding rituals around crop planting and harvesting. The natural cycles of the moon are also taken into account in a way long forgotten by most farming communities. The traditional farming methods work with nature to provide yields that are acceptable, without suppressing and distorting nature. Heritage Rice is the product of all these principles. Visitors to Ulpotha can learn more about this unique eco-project and see the healing of nature in action. At the party, the slideshow was rich in colourful images of the countryside at its most abundant and beautiful. Over 4,000 trees have been planted, including coconut, mango, jak and breadfruit trees as well as banana, papaya, avocado, woodapple, green orange, lime and rambutan. Ancient irrigation systems have been rehabilitated alongside the re-employment of traditional organic farming. A wide variety of vegetables, melons and yams are also cultivated. As a guest, one of the most special things is to be able to pick fresh, tropical fruit straight from the tree. All the food produce is grown in the village and much of it is vegan. It’s easy to get very healthy at Ulpotha. At the same time one can experience healing for oneself through herbal steam baths, ayurvedic oil treatments and massage. It is wonderful to discover that tourism can actually help the environment by its support of organic farming. In turning organic, the financial realities faced by the farmers have been addressed. This is crucial if the farmers are to remain independent and free from dependency on aid. The Foundation will ensure that the farmers will make no less than they would usually make in terms of profit by guaranteeing a higher-than-market price for their reduced harvest of rice ­ In effect securing that the farmers don’t lose out financially during the transition to organic farming. Once certification is possible, the Foundation will purchase all the organic rice harvested ­ at prices expected to be significantly higher than local market rates. Then it would be sold to wholesalers in western organic markets which would otherwise be inaccessible to the local farmers. The Heritage Rice, approximately 2500 kilos of it, is an important achievement of the East Pole Foundation and the village of Ulpotha. The project now needs further support, and any visitor to Ulpotha can be assured that this is eco-tourism in probably its purest form.